Are prices the same as price in the store, or drop with AliExpress sales? For example, I upload a product which costs me $10. The price in my store is $15. Suddenly, the product on AliExpress goes on sale for say, 50% off, therefore costing me $5. Would the price in my store retain the same $15 or would it drop in price since that product price is lowered. I asked this because if it's the case where the price lowers as the AliExpress prices lower, I think it would be a great idea to have an option where it only monitors the original price and disregards the sale price. Then all the storefront manager will have to do is adjust prices manually in price ranges for what they want to go on sale. If they don't they will keep the same prices and save more money. 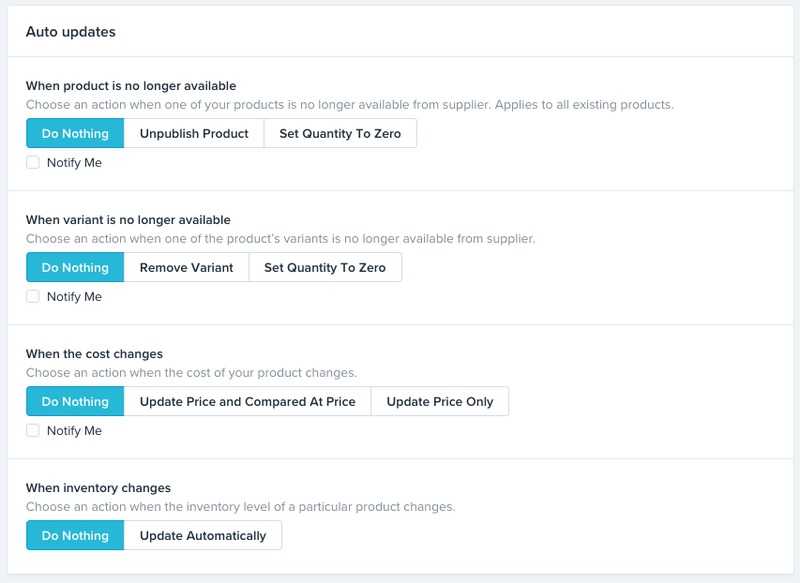 Oberlo has an auto-updates feature so you can decide if you'd like your products to update with Aliexpress or not! If you log in to your Oberlo app and go to Settings you can scroll down to see all the options available. Here is a more thorough guide explaining the options. Does that clear things up for you? Let me know! Magda Forgot this was there, haha thanks. If I select do nothing for the price but then set it to update price only a while after, will it refresh the prices of current in store products with what's currently on AliExpress?